Betway have been one of the many companies that have benefitted from the online boom within the betting industry. Formed in 2006, the company are now one of the leading online sportsbooks and whilst probably don’t get the exposure that some of the more established brands do, offer a great alternative for a lot of punters. The site is one that works with a number of sports. Whilst football is the main lure for most bettors, it’s worth noting that they do extensive work outside of football, especially with American based sports. However, this review will be looking at how it functions for football betting punters within the UK and working out if they are close to toppling a lot of the bigger brands. There are two ways in which most new brands set out to get people through the door. The pricing section is an easy route for many, but it often means they have to walk a very fine line between offering great odds and also making a profit. Betway have been synonymous with offering low margins on their bets. By this we mean that they are willing to give the punter a little more than most in return for taking slightly less themselves. For pricing, on the whole we would say that Betway are very much middle of the road; solid if you will. The bookmaker is able to provide a wide range of bets throughout the site, although we found that they were far from the best. Above we have a fairly typical example of what you can expect from Betway in terms of odds. As you can see, they aren’t best priced for any of the three markets on offer. At the same time though, they aren’t the worst price. They do tend to fall slightly below the line on the whole, which is a little disappointing. It’s not all doom and gloom on the pricing front though. As you can see above, they are best price on their won for the Crystal Place v Leicester match which is upcoming. These games are few and far between though, and this was the only best priced bet we would find for this market from almost 20 Premier League matches. It’s not all bad news though and as we expanded our search into the lower leagues of English football we actually found the site really pick up. There were more games where they were best priced on one of the three markets and also seemed to be much more consistent. The reason behind this, well, we aren’t all that sure. The money that comes in for Premier League matches will likely cover the rest of the English football leagues combined, so for a slightly smaller bookmaker like Betway, it means that it’s harder to offer top prices due to the volume of bets that come in. As there is less money in the lower leagues, they are able to have a little bit more flexibility with their odds, which means you get to see a number of price hikes over their usual, pretty poor Premier League prices. The market coverage is really good though and we had no complains here. There were hundreds to pick from and whilst we wouldn’t say they were the biggest, it definitely didn’t feel as though they were lacking at any point. Naturally, as you work through the lower leagues, the coverage does tend be less compared to that of the Premier League, but this is the same with pretty much all bookmakers. The whole layout of delving into the markets was something that we wanted to quickly touch on though. It’s definitely one of the better ones that we have seen. It’s selling point had to be that of the search functionality, which allowed you to type in your market name and then it pops up. It makes it so easy to just jump into where you need to be and not something we have seen within a bookmaker though. There were some markets missing, that of the Asian handicap markets as a notable one. Aside from that, it’s pretty comprehensive and one we enjoyed testing. International coverage on site is really impressive. There is a plethora of leagues from a whole host of pretty random countries if we are being honest. Some of the most obscure included the likes of El Salvador, Guatemala, Iran, UAE, Vietnam and Scotland (! ), to name just a few. Game and market coverage for these countries were also pretty impressive and whilst they didn’t quite hit the heights of the Premier League, although the top Euro leagues were very close, on the whole there was little to complain about. What we will highlight is that a lot of the less popular countries and lower foreign leagues didn’t go live at all. So, it’s worth noting, although the site does have a handy indicator to see which games are live. On site Betway don’t actually have a request a bet function that they advertise. 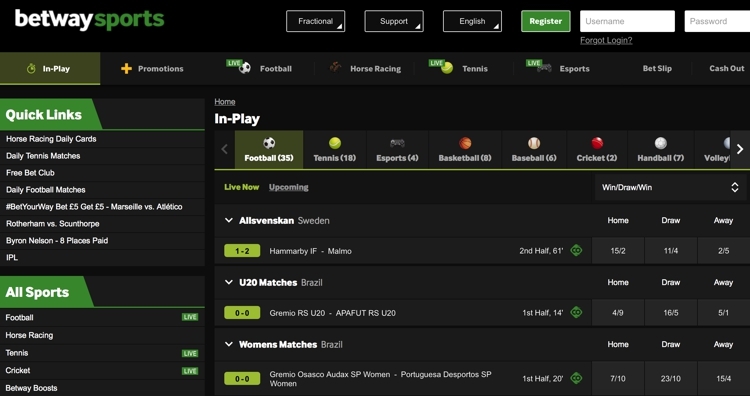 For those that aren’t aware of this feature within sports betting, it’s basically where you get in touch with the bookmaker to form a unique bet. They then take your selections and create a bet with a price for you. We have found a couple of older tweets that would suggest that you can access this feature though. The one pictured in this section shows that you need to tweet them for live Premier League matches (assuming on Sky Sports and BT Sports) using the hashtag #betyourway and they will form your bet. 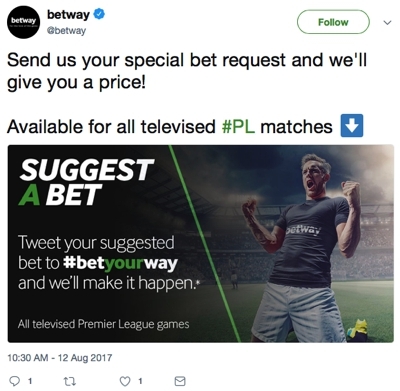 We’ve seen tweets up to about a week before uploading this article that suggest the hashtag works, with Betway fulfilling those selections into bets. Whilst not so much unusual markets, we thought it best to mention that the site offers a lot of goal related markets. These include the likes of goals scored between a certain of time, over/under, right up to 8.5 in some games with crazy odds attached, win-draw-win between certain periods of the games and many more. 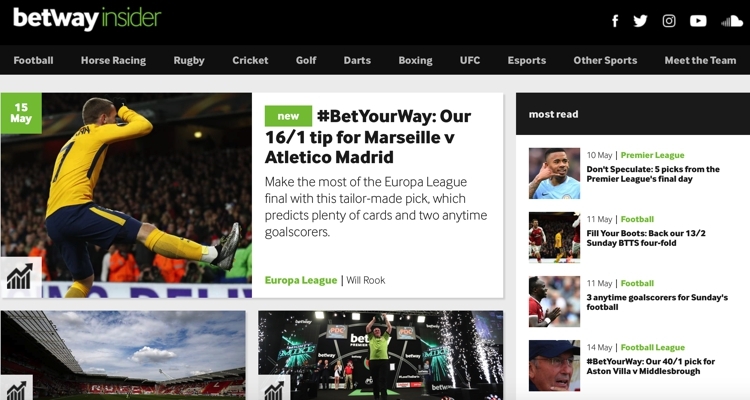 A feature that is certainly not something new to bookmakers, the blog at Betway offers a good range of articles on site. Where it stands out from other sites is that it’s update with great frequency. For example, on the day of writing there has been 11 articles added in total, with a range of sports covered within each of those articles. We really liked that all articles are geared towards potential bets and whilst not a tips section as a such, it certainly has that feel. They aren’t afraid to offer their opinion though and we’ve even seen writers flat out state the price at Betway for a certain market offered no value or was even a poor price. This means they aren’t just filling space to get people to bet, but instead offering some good betting advice, especially for sports that you may not be all that familiar with. Our top tip would be to check back Saturday mornings where they have a plethora of previews for Premier League and even lower league matches as well. We know this is a football related article, but we know that esports and football actually has a rather large crossover in terms of demographics. If this is not for you, just move on. The Esports section is as big as it comes online. Betway have been one of the leading lights in terms of promoting esports and even have their own professional leagues. What’s great is that you get a while sub section of the site dedicated to it and covers game such as Counter Strike, League of Legends, Overwatch, Call of Duty, FIFA and many more. If any major tournaments or events are on, there are few bookies that will cover it better than Betway. It’s always worth checking out their dedicated twitter page @betwayesports for promotions and price boosts. Back to the football! Cash out betting came in April 2017 at Betway and it’s pretty safe to say that it’s been a big success. They were actually quite late to the party, but then this isn’t necessarily a bad thing as it’s allowed them to get a look at the competition, see what works and what doesn’t, then implement that. The first thing that’s really cool is that you can see exactly which markets will be available for cash within the bookmaker. As you can see from the game below, the Win Draw win, 1stGoal and Both Teams To Score bets can all be cashed out, but the Result and BTTS market cannot. This works with all markets, no matter how deep you dive into their betting markets. Whilst this may seem an obvious inclusion, it’s actually very rare to see, so kudos to Betway here! At the minute there is n partial cash out, but it does allow for both single and multiple bets, which is good. 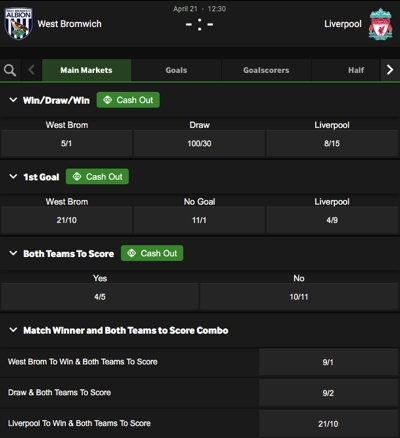 The in-play betting section at Betway is quite unique in that it’s way more integrated into the sportsbook than most. What we mean by this is that with most sites you go into a separate section, that’s aside from the bookmaker and really streamlined towards in-play matches and markets. 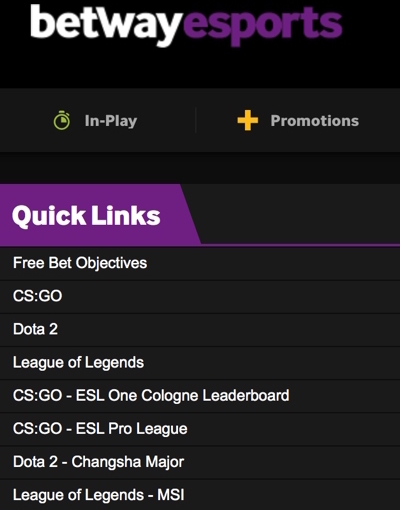 With Betway, you simply click “in-play” at the top and the middle section shows the games that are taking place. To be honest, it actually works quite well. It’s kind of no fuss, there it is, get on with what you need to do! It works, basically. The interface is very good and it’s only when you click on a match to see more betting markets that it really starts to come alive. The site is very customisable in that you can see as much or as little as you like. For example, at the top you can see either the live score, the match centre with live real-time updates, the stats for the games, line-ups and substitutions, running commentary (although pretty basic) and a graph of events throughout the match, which is pretty cool. In theory, they don’t actually offer a anything that hasn’t been done before, but in practice it’s got to be one of the best looking in-play sections that we have tested to date. The whole looks great to be honest, but this just tops it off for us. The market coverage is pretty good as well, carrying over from what we spoke about earlier in the article. One thing we did notice is that prices sometimes take a little longer than other bookies to update, which means you can’t always get the price on offer. For example, we seen where a goal has been scored, the score update but the price still showing as if no goal had been scored. The price remained, but you couldn’t back it in the bet slip. Not a huge issue, but worth noting we feel. As far as we can see, there are no limits on the maximum that anyone can win at Betway. It’s one of the most unique bookies for offering that, with most capping it within certain markets and even certain sports. They also have on hand a good number of banking methods to choose from as well. The usual suspects are all on offer such as Visa, MasterCard, Neteller, Skrill and a whole host of others. It is worth noting that not all deposits will act as withdrawal methods as well, so make sure you check before you make a deposit. We asked the question at the start of the article to see whether Betway were able to cut it with the big names in the industry. The short answer is no, but they aren’t all that far away. They do a lot of good things on site. The first thing that we picked up on is design and usability, both attributes at Betway. The unique look makes a great change to the often very boring bookies you see these days. The ability to switch quickly between sports and markets is a good thing and we liked the live betting so much that we could highly recommend this as one of the better platforms we have tested. The negatives are few and far between, but they are substantial. Their pricing structure isn’t all that great. It’s not terrible, but you get better value at quite a few others. We would also like to see a greater range of markets to choose from as well, possibly adding some new features such as different bets to accompany the site? Overall, a good effort from Betway and they will suit a lot of punters looking for something a little different than the usual suspects within the online betting industry.